In the midst of a brainsearing July 2017 afternoon I was staggering up Broadway in SoHo, seeking anything old and unexplained, besides myself. During these walks I often glance near the tops of buildings in hopes of seeing some “faded ads” I had missed, which isn’t many now as I have been doing this for over twenty years in earnest. Most of the new ones I find now have recently been uncovered because of building demolitions. But this is one I hadn’t seen, way up there, on the 9th floor of 520 Broadway just south of Spring. It’s Beaux-Arts and full of ornamental embellishments. But the words Oppenheimer, Bonham & Co. are rendered in straightforward sanserif. I googled them. I found some tragedy. 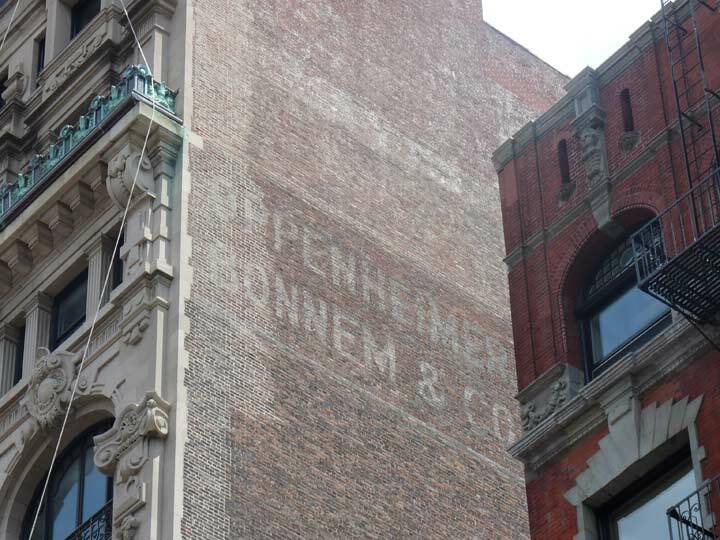 Apparently Oppenheimer, Bonnem was a textiles importer, with offices a little further north on Broadway. I investigated further and found that family members Max Bonnem and Elisabeth Oppenheimer married in Berlin and had a son born in 1924. Max was killed by the Nazis in 1937, while Elisabeth and their son were deported to Lodz, Poland in 1942 where they perished; from what, you might guess. I found in an online document that a claims resolution for 265,375.00 Swiss Francs (or $277,647.00) was made to an unnamed claimant, likely a family member, in a Holocaust Victim Assets Litigation suit in 2008. For lives lost in the charnel horror, there’s never enough compensation. My husband Ken Bonnem’s great grandfather was Abraham (aka Adolph) Bonnem, the Bonnem in that business along with his son Julius and the Oppenheimer was the brother of Elisabeth Oppenheimer, married to Ken’s great uncle Max. 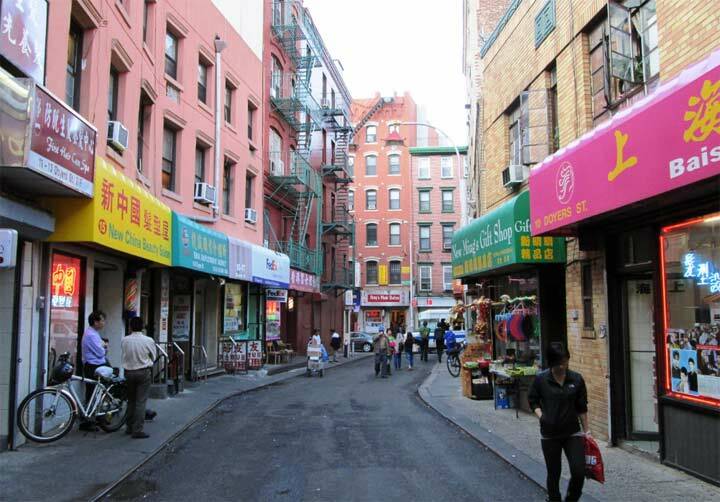 We live in Oregon, but made a trip to NYC in 2016 and spent a day looking up each of the addresses where they lived and had different textile company sites through the years. We chatted with a woman coming out of this building, took a picture of the front of it but never looked up like you did. Thanks so much for your article and especially the picture of their building on Broadway. Sadly, six of Adolph’s eight children, their spouses and almost all of their children died in the Holocaust. The two who survived were Julius and Ken’s grandfather Gustave who emigrated to Chicago.